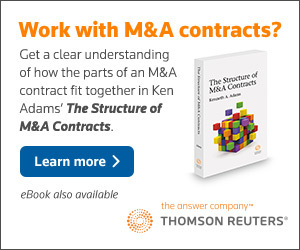 Adams is dead wrong in his views on the various “efforts” clauses one finds in contracts. Canadian courts do draw careful distinctions between the various kinds of efforts that may be required, except perhaps with the horribly ambiguous, “reasonable best efforts”. I’ve been fortunate to have readers point out when I’ve been wrong. Show me I’m wrong and you’ve made a friend. But that’s very different from this sort of drive-by shooting. To demonstrate that my analysis of efforts provisions is mistaken, Angela should have started by reading closely the 20 pages on the subject in the fourth edition of MSCD. Then she should have detailed exactly how I’m mistaken. Instead, she was content with simply observing that I’m dead wrong. It’s in fact Angela who is dead wrong, doubly so. First, as regards the implications of Canadian caselaw, she’s completely mistaken, as I explain in detail in MSCD. (If you don’t have access to MSCD, go here for my brief 2014 article on the subject in the Canadian periodical The Lawyers Weekly and go here for my recent article on endeavours provisions under English law.) And second, she expects everyone to take her word for it, without offering any analysis. That’s not how the marketplace of ideas works. I already have a sense of the basis for Angela’s objection. In the course of figuring out who Angela is, I realized that she and another Toronto lawyer gave in 2014 a presentation in which they discussed efforts provisions. Afterward, Angela’s co-presenter described me to one of my readers as a U.S. blogger who should pay more attention to Canadian case law on efforts, specifically Atmospheric Diving Systems. That happens to be the most illogical court opinion I have ever encountered, to the point of farce. Discussing it in my seminars is always good for a laugh. How could Angela have gotten this so wrong? I see two main reasons. First, it appears that her subject is contract law. (Go here for a list of her publications.) 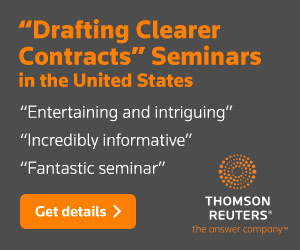 That’s why, as far as I’m concerned, she’s a marginal figure in the conversation on clear and modern contract usages: where contract law ends is where the real work of the contract drafter begins. I suggest that it’s a product of the cognitive dissonance that arises when someone who is steeped in the dysfunction of traditional contract drafting encounters something that challenges the traditional order. Because the traditional order and my views can’t coexist, something has to give. If the alternative is to overhaul your approach to contract language, some might find it simpler to reject outright what I have to say, with at best only a flimsy pretext. And second, Angela might simply not have been paying attention: her most recent article is from 2008. 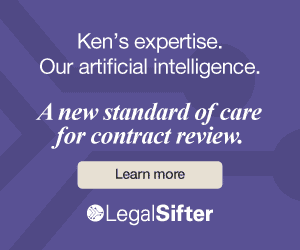 The legal industry is a big, complicated business with a lot at stake for lawyers and their clients. I and many others like me try to do our bit to reduce the confusion. Perhaps that’s out of fashion in “post-truth” America, but I’ll remain on the job. If you spout misinformation in the marketplace of ideas, you’re just making things more difficult for the rest of us, and I’ll take the liberty of rapping you on the knuckles with my truncheon. Oh, and what was the advice that Angela objected to? That you use only reasonable efforts and strike all other efforts standards from your lexicon. But that’s just part of the story; see MSCD for the rest.